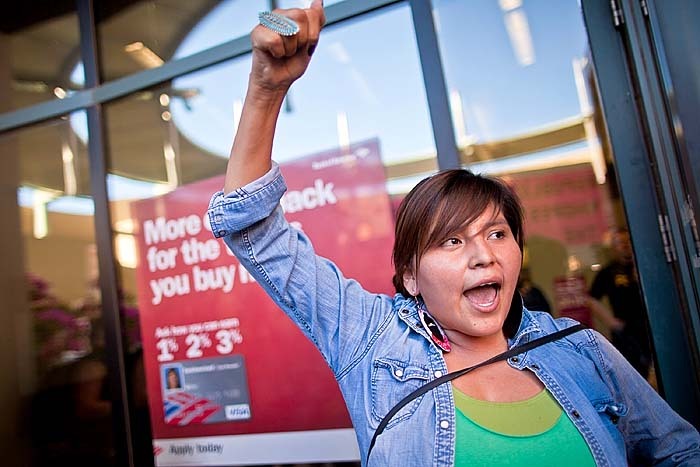 An Occupy Phoenix protester leads a chant in front of the Bank of America in Phoenix Friday night during a march to kick the Phoenix edition of the Occupy protests. About 300 people, from button downed office workers to anarchists marched through central Phoenix Friday evening to start the Occupy Phoenix that organizers hope will last through the autumn. The protest has been organized to support the Occupy Wall Street protest that has been going on in lower Manhattan since September 17. Protesters have a list of issue, but they are most angered by the growing economic inequality in the US, with the very rich getting richer while the middle class shrinks and working class falls further and further behind. The banks are a special target of protesters' ire. They are angry that the largest banks, which arguably caused the recession and economic meltdown, have gotten billions in federal assistance but, protesters claim, are now not lending or reinvesting in the community. These protests are sweeping the country and have been called the "American Autumn" just as protests in the Arab world earlier this year have come to be called the "Arab Spring." The march in Phoenix was spirited but peaceful and the protesters were looking forward to the occupation which starts Saturday. There are more photos of the protest in my archive and available from ZUMA Press.